More and more tractor trailers are operating on the roads and highways in Georgia. As more and more trucks continue to increase operation in Georgia, so does the increase or incidence of truck accidents and collisions in Atlanta and throughout Georgia. The statistics gathered by the National Highway Traffic Safety Program (NHTSA) and the United States Department of Transportation show that in 2007 roughly 413,000 large trucks were involved in traffic collisions throughout the country and approximately 101,000 persons were injured in those truck accidents. engage in aggressive driving behavior. Let’s face it – truck drivers are human and as such make human errors. 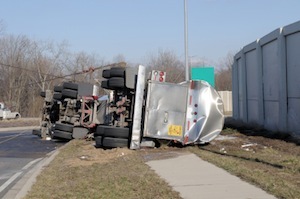 On occasion truck drivers are upset prior to the wreck, operate under driver related pressure to deliver a load on time or drive a certain number of miles before the next stop. There are many trucking companies throughout the country. Some companies are run responsibly and have good safety records and others are run irresponsibly and have poor safety records. Moreover, these trucking companies are competing against each other for contracts for the delivery of goods throughout the country. These demands sometimes lead to grueling physical demands placed upon the tractor trailer operators on the roads on Georgia and the country. Injuries from truck crashes in Atlanta and Georgia are devastating and can range from death to serious permanent injuries. The NHTSA has concluded that large trucks were more likely to be involved in fatal multiple vehicle crashes than were passenger vehicles. According to the NHTSA and Center for National Truck and Bus Statistics (CNTB) the largest number of truck accidents occur in California, Florida, Georgia, Pennsylvania and Texas and 2/3 of fatal truck accidents occur in rural areas in daylight. Georgia, as well as the federal government, has special laws that apply to trucks operating on the roads in Atlanta and throughout Georgia. Frequently, these laws limit the number of hours that a truck driver can drive without resting, the weight of the load in the trailer and most other aspects of truck driving. Often, the violation of these laws by a truck driver and the trucking company is the reason for the cause of the truck accident. The Law Offices of Kevin C. Ford frequently works with trucking experts to establish the cause and fault of the collision.